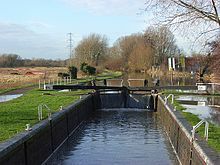 Fobney Lock is a lock on the River Kennet in the Small Mead area of Reading in the English county of Berkshire. Fobney Lock was built between 1718 and 1723 under the supervision of the engineer John Hore of Newbury, and this stretch of the river is now administered by Canal & River Trust and known as the Kennet Navigation. It has a rise/fall of 7 ft 8 in (2.24 m). Fobney Island, adjacent to the lock, is a wetlands nature reserve. ^ "Fobney Island in Reading transformed in conservation project". BBC News Berkshire. 13 May 2013. Retrieved 12 May 2015. This page was last edited on 21 June 2018, at 09:28 (UTC).